Located on the east coast of Awaji Island, Hotel New Awaji has a most splendid view of the Kitan Strait and Osaka Bay from all guest rooms. Visit our three spas, "Kuniumi-no-yu," opened in December 2008, "Awaji Tanada-no-yu," opened in July 2006 and "Tenkyu-no-shizuku" in the Awaji Yumesenkei. You will find both the Sumoto Onsen and our own nigoriyu (nontransparent) hot spring greatly satisfying. Our dinners feature fresh seafood from the Awaji Island area, which since the 7th century have been presented to the Imperial Family along with fish from the Wakasa and Shima areas. We also serve Japanese cuisine loaded with abundant seasonal ingredients, allowing one to enjoy the taste of each season. Slow down and relax at this blessed nook of Awaji island. 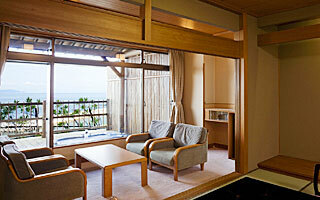 Yumedaichi, spacious, restful area with a brilliant ocean view where comfort is valued above all else. 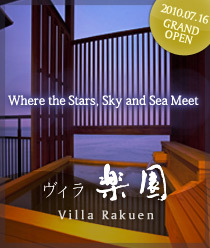 Villa Rakuen opened in July of 2010. It has outdoor spas and private wooden terraces in all rooms. Share time together at the seaside with those important to you. We hope our guests spend their time with us as if they were at home. 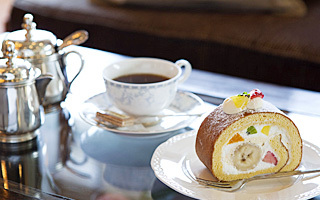 Dynamic functionality from the West along with Japanese style of relaxation will make our guests feel very comfortable. 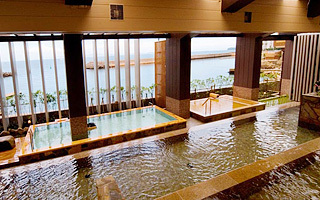 "Awajitanada-no-yu" and"Kuniumi-no-yu" found in Hotel New Awaji's bathing house "Spa Terrace Mizuki," feature "Sumoto Onsen," known as a curing spa, and our own nigoriyu(non-transparent) hot spring "Komoe Onsen." Enjoy these spas in various ways. 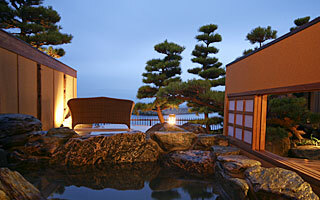 Also, on the hotel's top floor, is the reserved outdoor spa "Yumefusen" (50 meters above sea level). 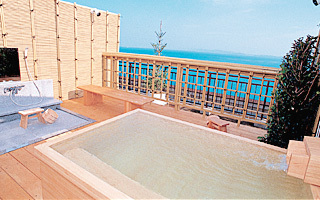 You can enjoy the wonderful view of the sea while bathing at the highest place in the Sumoto Onsen area. Connected by a seaside corridor, guests are able to use "Tenkyu-no-shizuku" in Awaji Yumesenkei's bathing house "Yuhinkaku." 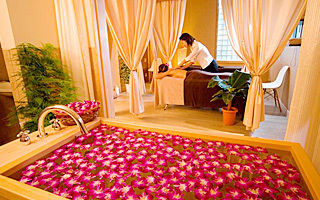 One can freely visit various spas without leaving the building. Enjoy a Great View from the Top Floor. Awaji is well known in Japanese Mythology as the first island to be formed in Japan. There is a great variety of fish and seafood products in the area. People say there is no fish you cannot catch. Yura Port on Awaji Island is well known for its tasty fish. We have colorful lunch and dinner menus. 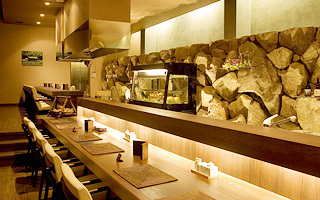 Meals feature dishes with fresh seafood, seasonal vegetables and Awaji Beef prepared in both stone roasted and shabushabu styles, Common Japanese Conger from Nushima in the summer and three-year-old tiger puffer from Fukura in the winter. Tell us your favorites. 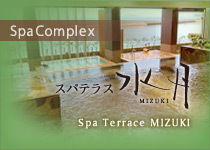 Guests can enjoy Hotel New Awaji and Spa Terrace Mizuki, which is connected to Awaji Yumesenkei by a seaside corridor. (Approx. 55 min.). A free shuttle service is available to the hotel (Approx. 5 min). *From Kobe via the Hanshin Express Way to the Tarumi Interchange and the Akashi Kaikyo Bridge (Approx. service is available to the hotel (Prior reservations are required. Approx. 15 min.). available to the hotel (Prior reservations are required. Approx. 15 min.). Copyright (C) newawaji. All Rights Reserved.